Excellent - Fractal moves to the top of the list then..... Love the way you've set it up. I do look at it thinking I need a bank of fans blowing down on the board and RAM. Makes perfect sense when we have all that room! Cooling is paramount on this board! I predict it may well not work, even though it survived reboots and power cycles, I have a feeling things out of my control will conspire against me! But - it was really good OC, so you never know! Fingers crossed! Last edited by crakej; 02-07-2019 at 06:34 AM. I haven't tried the cooler with its stock 2000 RPM fans. The specs of the fans seem pretty good, but they're white and not my thing. On a Thermaltake Core P3 they stick out like a sore thumb. When I got the cooler I immediately started with the fans you see in my signature which I moved over from my previous Thermaltake Water 3.0 360 AIO. Found 'em brand new and dirt cheap on eBay from a seller that was pulling them off new Corsair coolers. My guess is those coolers were going to a mining operation. Now I'm using 3000 RPM Noctuas @ 1500 RPM. Honestly, I'm not sure it was the wisest choice to spend money on the Noctuas when considering the performance I already had, but they do look cooler. You should try out Geekbench 3 Ive found that the memory scores are very consistent and even when you run a higher freq but is unstable, even slightly, will produce a worse score than a lower frequency that is stable. Ive been able to get up to 8200 memory score but that takes quite a bit of tweaking, 8000 is still quite good though. 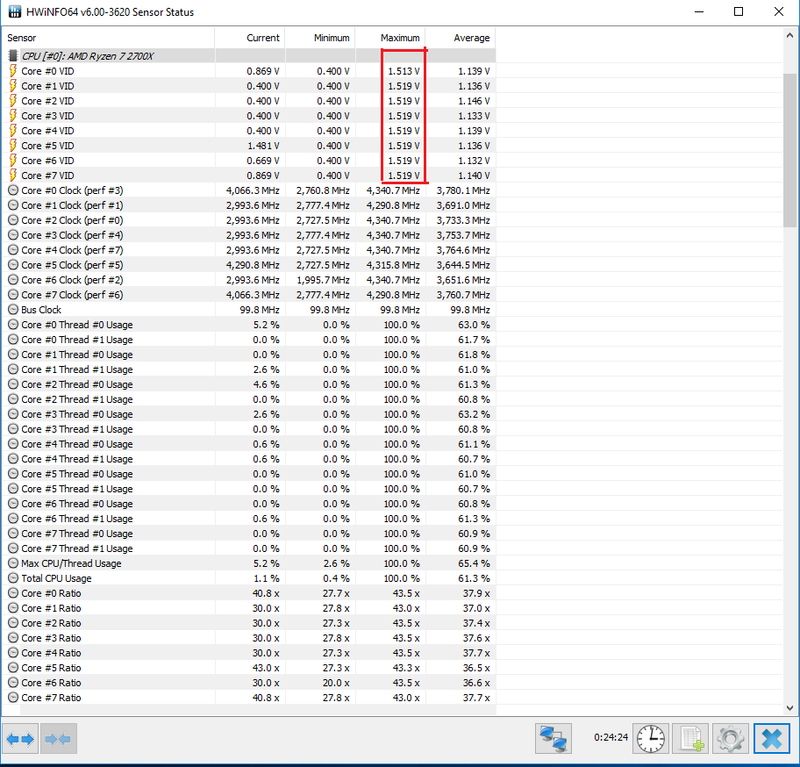 Run the 64bit test and if you dont want to buy the benchmark there is a way to still run the 64bit test by swapping the names of the files corresponding to each test in the Geekbench folder then just simply running the 32bit test and it will output 64bit results. IMO this is probably the best performance mark for memory. Last edited by crakej; 02-08-2019 at 11:03 AM. I keep forgetting you're using a 1700X. Great score. Just got this delivered...will start installing it tomorrow.. I didn't think anyone would be getting one of those. Are you using it for gaming or productivity? Hello all! This will be a lengthy post filled with newbie questions so i want to apologise in advance for polluting your thread and thank anyone that bothers going through it and maybe provide me with some answers. I've just put together a new 2700x/C7H build.Some additional information about the case/cooling as i think they are vital to give you a full picture and answer my main worry/question. Case is a Fractal Meshify C with 2 NF-A14PWM for intake and one NF-S12A for exhaust.Cpu cooler the NH-D15 with one of the NF-A15 fans it comes with and an NF-F12PWM in the front (instead of the second A15,as ram clearance cooler height and case size didn't allow for it).The tim used is TG Kryonaut.I also want to stress here that the system is an a *virgin* state : I have just done a basic install of W10 ,haven't downloaded any drivers/updates(save for the gpu) and the only programs i have installed are HWInfo64,CPU-Z,Asus Realbench,HWMonitor and Chrome. The mobo is running on its stock bios( 0804) and i haven't touched a single thing in the UEFI. Now onto my first question/worry. I am afraid i may have applied the TIM badly/insufficiently.Truth is the first time i went through with it,i botched it.I tried applying the Kryonaut the way der8auer shows on his youtube guide but i ended up having paste leak over the sides.To make matters worse when i took of the cooler to clean and reapply i managed to get some TIM on the cpu pins.Anxiety,baths in isopropyl alcohol and a nerve-racking slow clean with a toothbrush is what followed.So on my second attempt and whilst sticking to the same method ( the paste felt too hard/rigid to be applied in a peapod fashion) i was more conservative and left a good 1-2mm of uncovered space all around the edges of the IHS,hoping that pressure from the cooler would help spread any excess past from the middle and cover the entirety of it.Here's a screenshot of a 15min Asus Realbench stresstest and the temps i got on HWInfo64.Room temp is around 18-20*C.
Are these temps ok or do they just point to a bad TIM application/airbubles etc?Also my understanding from what i've read the Tdie value is the actual temp or is this wrong? Ok,prologue is over! ( i warned you this will be lengthy, don't bite ). 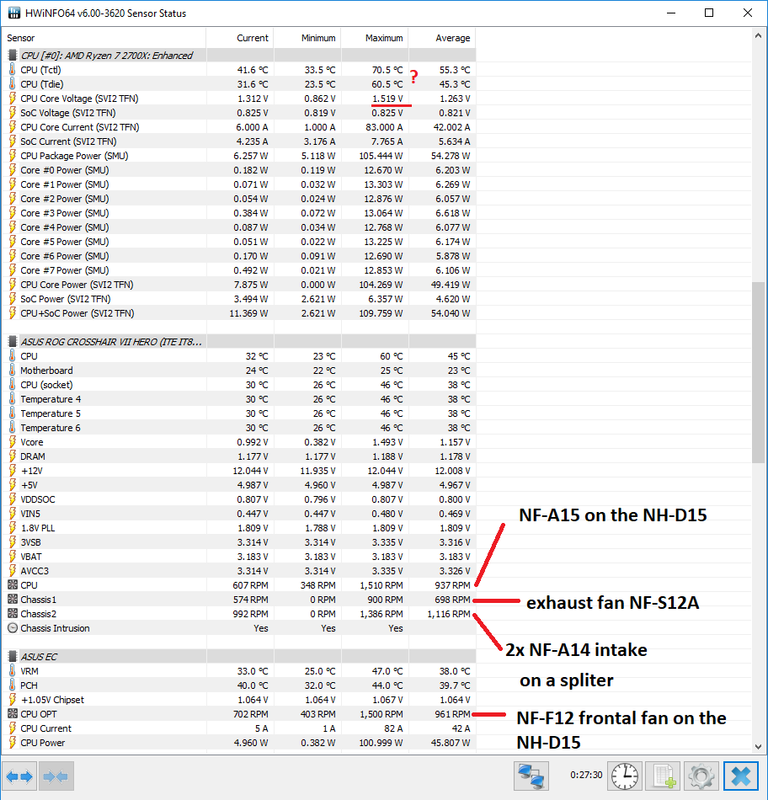 I want to OC /meddle with my UEFI and i have zero experience.I've read guides,watched youtube videos and browsed the relevant threads here well in advance of me buying the parts but quite frankly most of the posts fly straight over my head. I know there are quite a few guides out there ( here included) that just revolve around setting an OC preset on the mobo and let the AMD algos do their magic or run something like AI Suite but the following screenshot and my pc habits make worry this is not a viable road for me.I tend to build a PC and forget where the power button is( my nehalem pc has probably been cold booted no more than 10 times since 2008).So i want something that is stable 24/7 and is being used constantly.The following voltages don't give me that peace of mind and from my understanding unless i manually OC i won't avoid them ( or is maybe a simple vcore -offset just enough? ).Pic is also taken during the 15mins realbench. From what i've read 1.5 is the no-go over zone given by AMD and given my pc habits i would like to stay as close to 1.4 as possible.Is there maybe a guide somewhere in these 500 pages that i've missed or could anyone point me towards to where i should start looking/reading about the whole process?Ideally i would love to get to 4.2Ghz whilst being as close to 1.4V as possible and get my ram as close to 3600 as possible.Also am i correct to assume that i should first be done with my CPU oc and the meddle with the RAM or is my headcanon wrong here too? Btw i am running 2x F4-3600c15 8gb kits from Gskill. Lastly, i know people suggest you run the system on stock for quite a few days (game,run stress tests w/e) before you OC but these voltages i am seeing quite honestly scare me off and i would like to be done with it before i put the system under heavy load ( be it games or Vivaldi/Premiere). I understand that this whole thread and the nature of questions as wells as my evident lack of knowledge scream : please hold my hand.Now don't get me wrong,i would be grateful if someone did just that but that's not what i am asking.An answer to if my temps are normal and if i should reapply my TIM and a nod towards a guide on how to manually OC (again it's the damn voltages that have me worried which by the by reach 1.5 even now i m typing this and not running realbench) would be more than enough. Thanks to anyone that managed to go through this painful display of ignorance and again sorry for messing up your thread.